Anti-Gun Wolves in Sheep’s Clothing in St Paul! I have some very troubling news to share with you so please read this email in its entirety and take action to defend the Second Amendment in Minnesota. As you know, we spent the entirety of the 2017 session working to get Stand-Your-Ground law and Constitutional Carry moving through the legislature. Thanks to all of your efforts, we made significant progress in the House, passing the Public Safety committee and the Rules Committee before session ended in May. But what we also saw was Senate Judiciary Chairman Warren Limmer, at the behest of Senate Majority Leader Paul Gazelka, dragging his heels and refusing to hold any hearings on any pro-gun bills! And now we’re getting more information as to why NOTHING has happened in the Senate to advance your gun rights. Can you believe the audacity!? 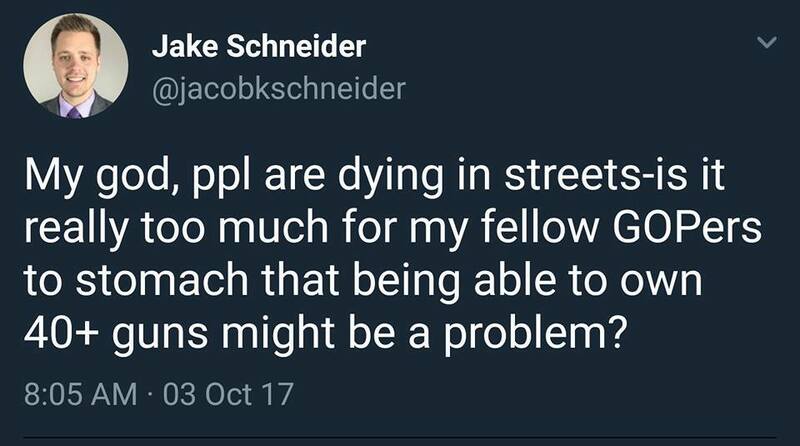 For Jacob Schneider to sit here and blame gun owners like you and me for the murdering rampage of a mad man is outrageous! Never mind the fact that the murderer passed all the background checks, bought all of the guns legally and jumped through all the hoops to own those firearms. But none of that makes any difference to Jacob Schneider. Instead, Schneider throws all law-abiding gun owners in the trashcan as if any Minnesotan who dared own more guns than what he thinks is reasonable, must be on par with a murdering madman! Leftists like Schneider aren’t just assistants to the legislature, either. Once they’ve been hired in St Paul, they quickly rise to positions of leadership and influence over legislators. And instead of sticking up for law abiding gun owners, Jacob Schneider shows his true colors and sides with anti-gun fanatics like Senator Ron Latz, Governor Dayton and the rest of the leftist gun-grabbers. This is an outrage to say the least, and anti-gunners like Schneider are NOT working for gun owners in St Paul and they should NOT be on staff for pro-gun majorities! As communications director, he easily has the ability to waylay and sideline critical information from pro-gun legislators to stop up advancements of pro-Second Amendment legislation. That’s why we’re asking everybody right now to call, email and Facebook Senate Majority Leader Paul Gazelka and tell him to CLEAN HOUSE and fire Jacob Schneider! Tell him that nothing else will be sufficient and nothing else will bridge this gap with gun owners. It’s clear that the majorities you and I put in place don’t want to pass gun rights legislation and they don’t want to honor the gun owners who put them in power in St Paul. That much was made very clear last session. These people need to be yanked by their chains and put in their place if we’re to see gun rights defended and advanced in Minnesota. They are not our masters – they answer to us, and it’s well past time they were reminded of this fact! You see, Minnesota Gun Rights gets accused from time to time by arm-chair quarterbacks and fanboys of being “too hard” on legislators or being too “mean” to politicians in both parties in St Paul when fighting for your gun rights, and they demand to know why. People like Jacob Schneider are exactly why. At the end of the day, if politicians’ feet aren’t held to the fire and they aren’t forced to face the music at election time, they’ll stab gun owners in the back, smiling the whole time. So contact Senator Majority Leader Gazelka right away and tell him that enough is enough, fire Jake Schneider and quit dragging his heels on Stand-Your-Ground law! Make no mistake about it, Site, anti-gunners have been frothing and foaming at the mouth waiting for an opportunity to pass sweeping gun-control legislation both at the national and state level. They never let a crisis go to waste and we’re in for a MAJOR fight in 2018, believe me. So if you’re not already a member of MGR, please join up now! If you’re already a part of our grassroots army, please consider a generous contribution to help us do battle on behalf of your gun rights in the weeks and months ahead. Whatever you do, contact Senate Majority Leader Gazelka right away, as that’s most important! P.S. Anti-gun wolves in sheep’s clothing are working for the Senate GOP Caucus in St Paul and undermining our gun rights! Please read the email above and take immediate action to root out these anti-gun leftists and help pave the way for gun rights restorations in 2018. When you’re done, please consider a generous contribution to help us fight on all sides to defend the Second Amendment from these recent attacks and push our pro-gun agenda!